Craftprojectideas.com generously gave us two of the products featured below to try out and giveaway to you! This post contains affiliate links. Christmas is almost here and with my daughter's birthday and then all of us getting sick during the first part of December, I am really behind on getting gifts purchased for Christmas. I am not the sort of person who buys gifts all year long... so I'm in a bit of a panic right now as I try and finish up gift buying. One thing I love to give as presents are crafting materials and kits. Craftprojectideas.com has several kits and crafting supplies that I love for the 6 and under crowd. You might find something for your kids on here too. We recently tried out the Ultimate Box of Projects and Weaving Loom and are excited to give both kids away to one awesome Toddler Approved reader. Scroll down for more details. Tape it Up- We really love anything that involves tape. This kit is for kids 6+, but as long as an adult is helping, younger kids can do it. My daughter loves accessorizing with tape. Weaving Loom- This kit is for kids 5+ and is great for building finger muscles. It is also addictive. Ultimate Box of Projects- This kit will seriously keep kids busy for hours. It is for kids 4+ but I was able to sit and do many of the projects with my 3-year-old as long as I was close by to help. Paint Dab markers- These markers are seriously the best. Perfect for toddlers on up. Foam Stickers- You can never have enough foam stickers. Craftprojectideas.com has a great selection. Sand Art- I loved sand art growing up and my kids love the feel of sand and enjoy exploring the colors. This activity is for kids 5+ but with some help younger kids can enjoy it too. The other afternoon we opened up the Ultimate Box of Projects and I was pretty amazed at the variety of stuff included in the box. Here are just a few things that we made from the box along with favorite kid's books we read along while we created! 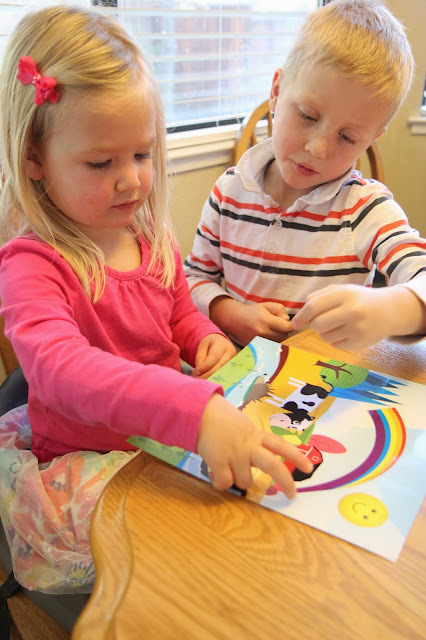 We made Farm sticker pictures (which were so cool that my 5-year-old had to "help" too) while we read Moo Baa La La La by Sandra Boynton. We created a foam heart project while we read I Love You, Stinky Face by Lisa Mccourt. 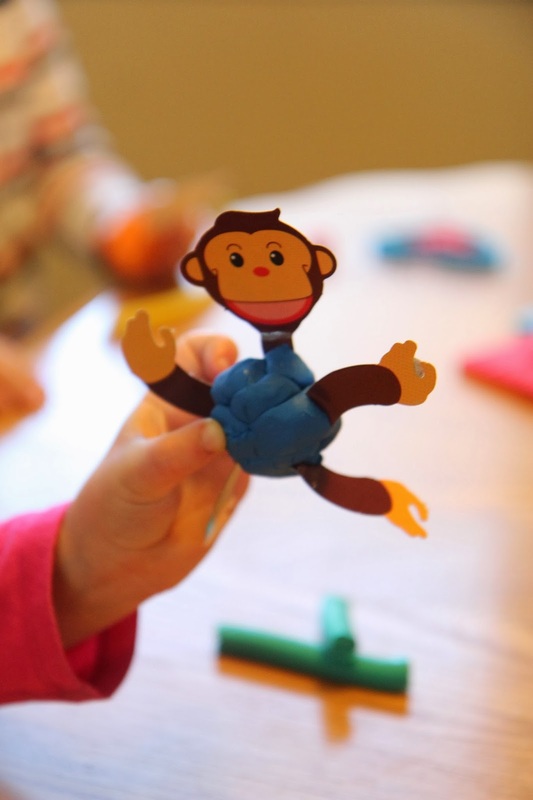 We put together playdough animals while we read Five Little Monkeys Jumping on the Bed by Eileen Christelow. And that was only half of what there was in the box. 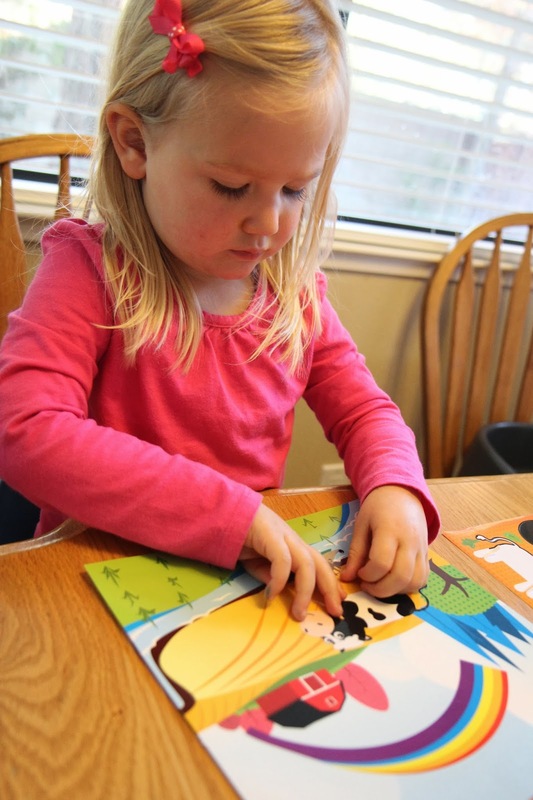 Pairing each activity with a children's book was a lot of fun too! Now that we've shared some of our favorite craft ideas along with kid's books, let's announce our giveaway from Craftprojectideas.com!!! You can find loads more resources for kids over on Craftprojectideas.com or on their Facebook and Pinterest pages. Many of their products can be purchased at Wal-mart! Make sure to use an email that you actually use... so we can contact you when you win! You can get up to eight entries by completing all eight tasks mentioned in the rafflecopter form below. This giveaway is open for entry from Friday, December 13th to Wednesday, December 18th at 12:00am (PST). The winning entry will be drawn on Wednesday, December 18th. I will notify the winner via email. 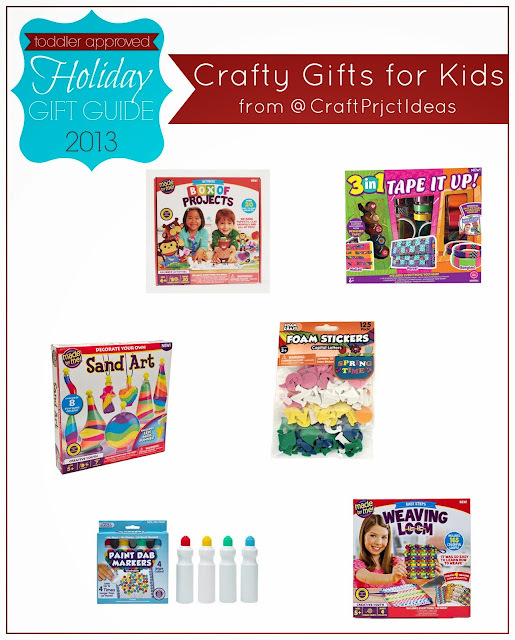 Make sure to check out our 2013 Toddler Approved Gift Guide page if you are looking for more ideas for your kids or friends! It will continue to be updated over the next week or so. 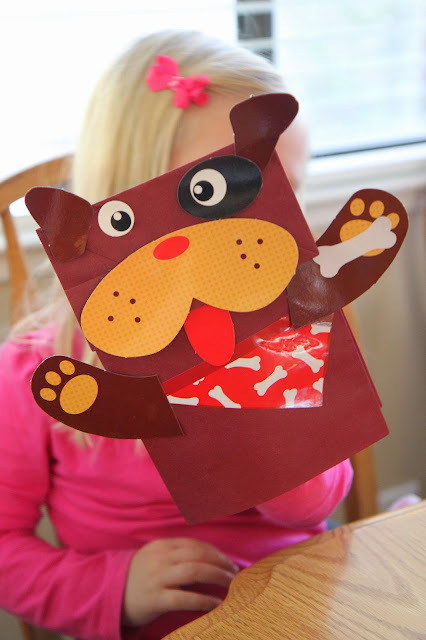 Craftprojectideas.com is dedicated to kids’ arts and crafts projects for preschool children to tweens! From holidays to rainy days, the classroom or at home, you will find step by step instructions to inspire kids with arts and crafts! Many projects on the site contain templates you can download to create at home. You can find Craftprojectideas.com on Facebook, Pinterest, Twitter, andYouTube. Disclosure: This post and giveaway are sponsored by Craftprojectideas.com. All opinions in this post are mine! This post also contains affiliate links. One of my favorite holiday traditions is the Christmas casserole we eat every Christmas morning with my family! Sounds like fun! My kids would love it! We love to sip apple cider and sing together. Also sledding, looking at the Christmas lights, and trying new recipes for sugar plums. Thanks for the giveaway! Our favorite holiday tradition is baking lots of yummy treats together! we love baking cookies for our neighbors! Making our chain advent calendar then doing all the fun activities. Our homemade ornaments are a favorite, puppies included! Making a bunch of finger foods and watching Christmas movies all day on Christmas in our pajamas! Our favorite Christmas tradition is on Christmas Eve. We eat dinner together, bake and decorate cookies, then deliver them to the fire station before going for a drive to see Christmas lights. My favorite holiday traditions is picking out our Christmas tree on the day after Thanksgiving, and decorating it together. We visit lots of family- my husband's family the week before Christmas, my grandparents on Christmas Eve, and my parents on Christmas day. It's a lot of running but the kids LOVE sharing the holiday with everyone and that is totally worth it!! Thanks for the fun giveaway!! We don't decorate much until a few days before Christmas, and then we leave everything up until Epiphany on January 6 for the 12 days of Christmas.